distance Distance between the sphere center and the object. radius Radius of the sphere in which the force is applied. All physical bodies and particles that are within the radius of the force are pulled up to or away from the center of the physical force node. Also the bodies and particles can be rotated around the center of the physical force node. The physical force will affect particles only if their physical mass is nonzero. The physical mass for the particles can be set on the Particles tab of the Parameters window. 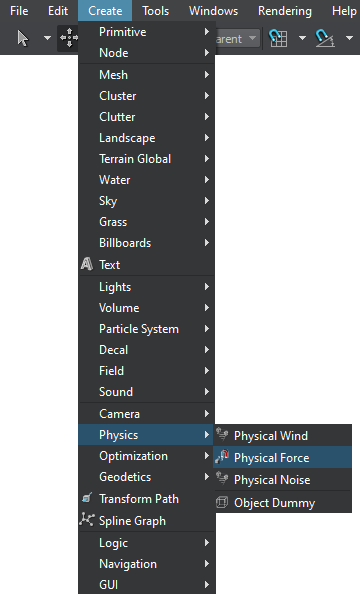 On the Menu bar, click Create -> Physics -> Physical Force. Click somewhere in the world to place the physical force. 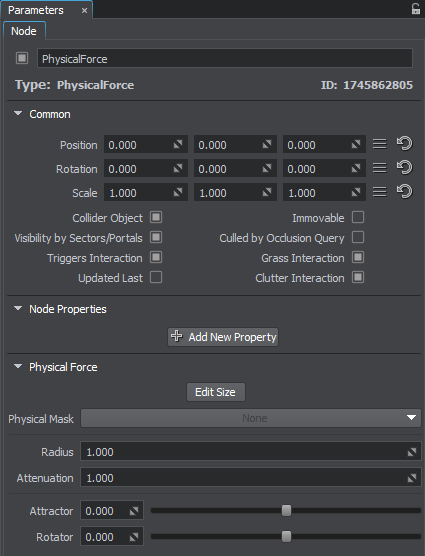 The new physical force node will be added to UnigineEditor and you will be able to edit it via the Parameters window. By default, the radius of the node is 1. Toggles the editing mode for the physical force node. 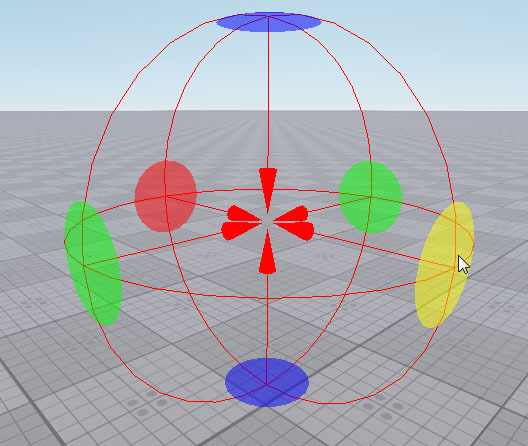 When enabled, the radius of applying the physical force can be changed: each axis is highlighted with the colored circle. 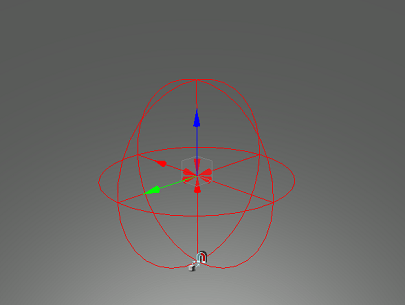 To change the radius along the axis, drag the corresponding circle. Physical mask. The physical mask of the physical force must match the physical mask of the physical object. Otherwise, the physical force won't affect the object. Radius for applying the physical force in units. Attenuation factor indicating how much the physical force decreases when the objects move away from the force center. Attraction force applied to objects in the physical force radius. If a positive value is provided, objects will be pulled away from the force point. If a negative value is provided, objects will be pulled up to the force point. Rotation force that is applied to objects in the physical force radius. If a positive value is provided, objects will be rotated clockwise. If a negative value is provided, objects will be rotated counter-clockwise.